After the Annual General Meeting on April 15th 2013 the members toasted the retirement of Dorothy Critchlow. Approaching her 90th Birthday, she retired from her position as Treasure and Booking Officer. She served on the Village Hall Committee for an outstanding 60 years. Chairman Jean Allen presented her with a DISTINGUISHED SERVICE AWARD in grateful appreciation of her 60 years of dedication and service. 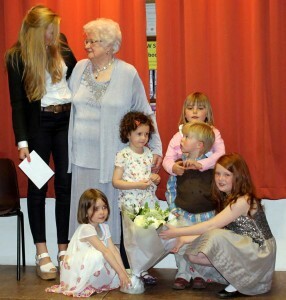 On Friday 3rd May, The Village Hall Committee hosted a surprise party for Dorothy. CLICK HERE to read the Ashbourne News Telegraph article on this. In Autumn 2011, the village hall committee faced a difficult decision whether or not to continue with the £100,000 project to build and equip an extension to replace the old school toilets with disabled facilities and to provide new storage areas and a meeting room. With the help of grants from Staffordshire County Council, Robbie Williams, Garfield Weston Foundation and £20,000 of local donations the project was able to proceed. Chairman, Jean Allen went on to say, “Along with past projects, we have transformed the old village school into what is now a first class village amenity which we can be proud of and will benefit our community for years to come. Thank you all for your help”. The 100 people attending the ceremony on 29th September 2012 saw Mrs Dorothy Critchlow cutting the ribbon to officially open the new extension. Dorothy was presented with a huge bouquet of flowers to mark her amazing achievement of 60 years service on the committee. Until the late 1960s the Old School Garden was used by pupils to grow vegetables. Following closure of the village school in 1982 and the subsequent purchase of the building as our new village hall in 1985, the garden was included as part of the property belonging to Alstonefield Education Trust. Following the kind offer of the Education Trust to sell this piece of land to the Village Hall and the very generous offer by the family of the late Les Griffin to pay for it and donate it to the Village Hall Committee in Les’s memory, the official re-opening of the garden, by the Griffin family, took place on the afternoon of Saturday 27th June 2009. The weather was kind to us as many gathered to enjoy tea, cake and light refreshments in the garden afterwards.